Attention Deficit Hyperactivity Disorder (ADHD) is unfortunately a common behavioral disorder. It is estimated that as many as 5 million children in the United States are afflicted with attention deficit disorder in varying degrees. Traditional methods are aimed at turning down the child’s level of activity with the use of pharmaceutical drugs. With uncertainty in the safety of prescription psychostimulants as the medical treatment, and as the side effects, including personality changes and permanent changes to the brain, cause many parents to look for alternatives. More and more are wisely turning to chiropractic. Chiropractic is a drug-free ADD treatment, addressing the important relationship between the nervous system and the body. There are multiple research articles on the effectiveness of chiropractic adjustments on ADHD and that chiropractic care is the most popular choice of all the alternative therapies. The statistics show that chiropractic care was 20-40 percent more effective than commonly used medications. By having subluxations corrected, your child will have a better opportunity to be as healthy as possible. However, since ADHD appears as a neurological disorder and chiropractic care helps reduce nervous system disturbances, many parents who want a natural, non-drug solution for their child have found chiropractic care helpful, even miraculous. Children that were taking medications before beginning treatment even had decreases in dosage or were able to stop completely because they were no longer needed. Let the testimonials speak for themselves! Most parents start with making nutritional and lifestyle changes. Remove sugar, artificial sweeteners, food dyes, preservatives and additives from the diet. Eat as natural and organic food as possible. Aldo try to reduce the use of chemicals in the household including cleaning products, detergents, and fabric softeners. As parents, we want the best for our children. If your child exhibits the symptoms of ADHD, you know it affects virtually everyone your child is in contact with. Before you submit to drug therapy, make an appointment for a chiropractic evaluation. Dr. Anna Saylor & Dr. Ashley Budnik are pediatric and family chiropractors, who specialize in neurodevelopmental disorders such as Autism, ADHD, Sensory Processing Disorder, and Seizure Disorders as well as common childhood conditions like Ear Infections and Asthma. They have extensive education, experience, and passion in these areas, and have a large family practice in Royal Oak, MI serving this population, as well as general family wellness. Dr. Saylor has a D.I.C.C.P and both doctors have hundreds of hours of post-doctorate education and training in the care of pediatric patients. From their training and clinical work, their approach is radically different. Unlike those who are content covering up symptoms with drugs and medications, Dr. Saylor & Dr. Ashley share the concern of many parents, that many of these conditions have a common cause and most have a real solution. Does your child struggle with Spectrum and Sensory related issues? Have you tried multiple therapies and perhaps even multiple medications? If you answered YES to either of these questions, you need to attend this informative and impactful event in order to PREPARE FOR YOUR CHILD’S BEST YEAR YET! The definition of a “Perfect Storm” is when a few bad things come together and combine to create absolute mayhem. Led by preeminent experts, Dr. Anna Saylor & Dr. Ashley Budnik, this important presentation reveals the newest science and research, teaching you some of the most common “ingredients” that constitute these now pandemic issues. Once you know each critical “ingredient” that makes up ADHD, Sensory Processing Disorder and Chronic Illnesses, you can take steps to prepare for your child’s best year by unraveling the storm NOW and by preventing further storms in the future. Sharing this information with you so you can take that first step towards your child’s health and happiness is the primary goal of this event. You won’t leave just with information about these challenges; you will leave with actual things you can do immediately to help your child live the life they deserve. We look forward to sharing a healthier view of your child’s future with you! Want more info? Attend one of our next Perfect Storm workshops, or watch the Perfect Storm video above. Click here to see when our next event is, or Call 248-616-0900 for more information. Dr. Saylor and Dr. Ashley with AJ. Hi I’m AJ’s mom, Rose. AJ was born with torticollis which means one side of his neck was over develop in the other side was underdeveloped. He was delivered by C-section 11 days early. I carried very high in my pregnancy and at delivery he hadn’t even dropped n position to be delivered so he had to be pushed down to be delivered. He was 9 pounds and 15 ozs at birth. Since third grade has suffered with some focusing issues at school and home. Homework, classwork and reading were becoming an issue. He couldn’t stay on topic or be still physically. This past school year, things got worse. At first we thought it was just 5th grade was harder, however 3 hours a night to complete homework just wasn’t right. We had him tested and found out he suffers from mild to moderate ADHD with primarily focus issues and from dyslexia. After attending the Perfect Storm session we did a reevaluation and started a series of treatments with Dr. Saylor and Dr. Ashley at Van Every Chiropractic. After one month’s time we have seen a major change happen with not only his scans but in his behavior. He’s no longer very hyper and climbing the walls and bouncing around. He’s more focused and concentrated in his conversations, and he is calmer. And have even noticed some improvement with his focus and attention in his summer reading and doing chores. AJ is very aware of what is going on and is working to improve his posture as well as his physical health. We have chosen not to use prescription drugs to treat him but to go more natural healing with adjustments. 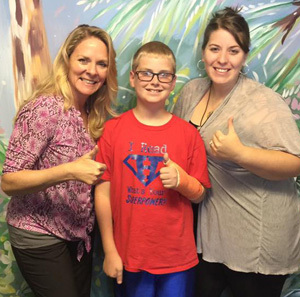 We can’t wait to see what the new school year brings for AJ as he continues his maintenance treatments. Thank you to Dr. Saylor and Dr. Ashley!